Tom Hoffman received a B.S. in psychology from Georgetown University in 1972 and a B.A. in 1980 from the now-defunct Oregon College of Art. He has lived in Alaska with his wife Alexis since 1973. They have two adult children and two adorable grandchildren. Tom has been a graphic designer and artist for over 35 years. Redirecting his imagination from art to writing, he wrote his first novel, The Eleventh Ring, at age 63. The Bartholomew the Adventurer Trilogy and the Orville Wellington Mouse adventures are multi-leveled stories which have been compared to classics such as Chronicles of Narnia, The Hobbit, and Neverending Story. The books were written for his grandchildren to enjoy as children, then read again on a deeper level as adults, with their underlying themes of ethics, metaphysics, philosophy, quantum physics, and spirituality. A common thread running through the books is the idea that there is no magic, only science we don't understand. The books were written to provide an alternate way to view the world we live in. To see all life as a single force, all life equally precious, no matter the form. A world where violence is not necessary, a world where the protagonists are changed forever by their difficult choices, by their own sacrifices. A world of empathy, kindness, and love. And of course, ten foot tall ancient robotic rabbits and gigantic carnivorous centipedes living on post apocalyptic planets! Orville Mouse and the Puzzle of the Last Metaphonium by Tom Hoffman is an expertly written fantasy novel. It’s the fourth in a series about the Metaphysical Adventurer (a.k.a. world-hopping) Orville Wellington Mouse. Orville is a shaper, meaning he’s magically gifted, and when a highly interactive dream about a ghost and a book fair leaves him with a weird book in a language no one can read, his sassy girlfriend, Sophia, and their loyal ally, Proto, join him on a quest to decode the book. The results uncover a long-lost piece of ancient history and when the adventurers enter the surreal world of Elysian in search of a friend’s long-lost wife, they take on the mysterious Shadow King, accompanied by an austere monk who’s more than he seems. Will Orville be able to find reality and solve the puzzle of the Last Metaphonium? Tom Hoffman is a delight to read. His world is endlessly complex, varied, and filled with flights of fancy, yet completely true and simple as well. The characters ring with a deep, supple humanity, and I was captivated, wanting to know what would happen next. Action, comedy, mystery, adventure, romance—it’s all here. Orville’s many little quirks make him thoroughly well-rounded, and the underlying theme that love and honesty can overcome fears was handled as melodiously as the concept of the piano-like Metaphonium, in which sets of keys provide portals to other worlds. Quiet sidekick Proto absolutely steals the show, his fears that he’s not loved and accepted threading a delicate subplot that is as poignant as it is satisfying. Verbally enchanting, emotionally human, and philosophically relevant, The Puzzle of the Last Metaphonium blends many genres into a really fun read. Orville Mouse and the Puzzle of the Last Metaphonium: Orville Wellington Mouse, Book 4 is a young adult adventure fantasy novel written by Tom Hoffman. It was a beautiful autumn day, and Orville had a new puzzle to occupy his ever curious mind. How did that book end up out of his dream and in his bed with him in the morning? He knew that Sophia would be just as curious as he was, and he was hoping that she’d be able to understand some of the mathematical parts that prompted him to pick it up in his dream in the first place. And the beautiful mouse who figured so prominently in that dream and seemed so sad and tired? As he walked to work that morning, Orville was stunned when he noticed strange lights along the wooded path, lights which transformed into a ghostly image of that beautiful mouse who addressed him by name and asked for help. How could she know his name, and how would he be able to help her? Tom Hoffman’s young adult metaphysical adventure fantasy, Orville Mouse and the Puzzle of the Last Metaphonium: Orville Wellington Mouse, Book 4, is a glorious romp through the fabled land of Elysian where anything you dream of or fear may very likely come true. I had the grandest time reading this enthralling adventure yarn which somehow makes quantum physics painless and perfectly understandable. Hoffman’s plot is lively and filled with twists and turns that keep both the characters and the reader on edge. His characters, especially Orville, Sophia and Proto, seem to come of age in this tale as they confront their own demons and greatest fears, and find their inner combined strengths to be prodigious indeed. While this book can be read and enjoyed on its own, I would most strongly recommend the new reader start with the first book in the series, but if you can’t resist, Hoffman does give enough background without giving any spoilers to ruin the experience of going back after this one. Best of all, there’s a definite sense in the air that there will be more puzzles for Orville to solve and that’s such a very good thing. Orville Mouse and the Puzzle of the Last Metaphonium is Hoffman’s best fantasy novel yet, and it’s most highly recommended. If you are a fan of the Orville Wellington Mouse Metaphysical Adventurer books, as I unabashedly am, you’ll know how prophetically Proto the Rabbiton confronts his friends in the first few pages of Orville Mouse and the Puzzle of the Last Metaphonium by Tom Hoffman. “I knew it, you’re hiding something! We’re off on another terrifying adventure filled with all manner of horrifying beasts scuttling about in the darkness, waiting to pounce, snaring us with their razor sharp claws and venomous fangs.” The only aspect Proto neglects to mention is how much humor and magic such a perilous adventure might entail. In this fourth installment of a highly successful, award winning series, Tom Hoffman has produced in The Puzzle of the Last Metaphonium both a plot and a literal device that almost defy imagination. Except that imagination might verily be the name of the game itself. The last Metaphonium – the device - is one ingenious invention. Not your parents’ Sound Piano, nor your grandparents’ either; this one literally takes you to other worlds. And it is on the most important adventure quest of all – to locate a missing loved one – that Orville, his girlfriend, Sophia, and their personal protector, Proto, dare the prophesied terrors of a mysterious other-world in order to successfully complete (survive) their mission. Metaphysically replete with the wisdom, humor, adventure, unspoken love and oatmeal cookies that young and old have come to expect from Orville Mouse, The Puzzle of the Last Metaphonium satisfies all your cravings. Except for the oatmeal cookies. Those are incumbent upon yourself; unless, of course, you already happen to be a Shaper. Read the book! Tom Hoffman’s Orville Mouse and the Puzzle of the Last Metaphonium was a joy to read. Hoffman opens with a dream sequence that sets the stage for Orville and his friends, Sophia and Proto, to go on their next adventure. Orville and Sophia are members of the Metaphysical Adventurers and when a beautiful ghost asks for their help, the friends start investigating, along with the robot sidekick, Proto. They travel to a synthetic world called Elysian, by way of a mystical Metaphonium. They encounter many interesting people along the way as they try to understand the changeable environment of Elysian. They are joined on their quest by Brother Solus, the last of the Mintarian Gray Monks, who has no memory of how he arrived in Elysian and seems a mystery in his own right. Together, they journey across vast oceans, through putrid swamps, through massive forests, and past an insurmountable wall to reach the beautiful ghost and, in so doing, solve the puzzle of the Metaphonium. Tom Hoffman has written a great adventure. His characters are fully developed and endearing, with all their individual quirks and traits. Hoffman writes to a youthful audience (3rd-5th grade), and he writes with intelligence, drawing his readers forward, rather than relying on gimmicks so often employed for this age group. Hoffman offers a larger world to his readers, an expansion of their understanding of the possibilities. His word choices are precise and often chosen to increase his readers' vocabulary by introducing a complex word, then developing the scene to provide context. Orville and his friends have to work as a team to solve the puzzle, each member of their party brought something unique to the table, and none of them could have done it alone. Orville Mouse and the Puzzle of the Last Metaphonium has everything a young reader will enjoy, humor, great action sequences, believable dialogue, fantastic friendships, and a powerful message about facing our fears. This book was nicely done, Mr. Hoffman. Orville Mouse and the Puzzle of the Last Metaphonium by Tom Hoffman is the next Orville Mouse adventure that you won't want to put down. When Orville wakes up from a dream, he discovers that he brought back a book with him in a language he can't understand. Pulled into the book's curious origins, Orville teams up with Proto and Sophia to find the mysterious land of Elysian. With the aid of pirates, the group embarks on a dangerous adventure that may be more than they bargain for. The mystery reveals the magic of imagination and books as Orville, Proto, and Sophia go in search of the book's origins. The fact that they're talking animals is never an issue as they're lively and realistic characters with vibrant personalities, fun banter, flaws, and strengths. They're easy to connect with and adore. Orville has a playful personality and is full of imagination. The story starts from his dream as he brings back this book. The journey to translate it and the discovery of the island that is seemingly there and not there make you want to be part of the story. There's a subplot of Sophia getting jealous of the ghost mouse, as she often calls Orville out for referring to her as beautiful. As jealousy is often used in a frustrating character trait, Sophia never strays from being smart, clever, and enjoyable. Tom Hoffman brings Elysian to life, describing it as a “land of endless surprise” and “part real and part dream.” It has danger and a similar magic that brings to life worlds like Neverland and Oz. 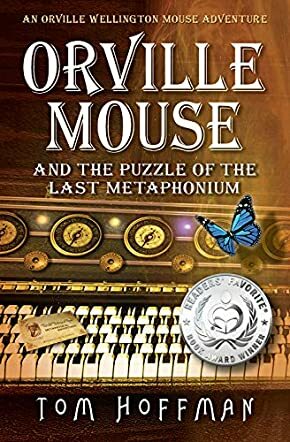 A charming adventure, Orville Mouse and the Puzzle of the Last Metaphonium is humorous and clever, with danger, pirates, a beautiful ghost mouse, and an exciting world brought to life with imagination.